Indigenous protesters have suspended talks to lift protests with Colombia’s government after the latter failed to promise it would not stigmatize or criminalize protesters, the national indigenous organization said Sunday. The ONIC and regional organization are furious with Defense Minister Guillermo Botero who accused the peaceful protesters of being aligned with guerrilla groups that have attacked security forces. The national indigenous protests were called on Friday after talks with the regional indigenous organizations of the Cauca province were suspended by the government that accused the locals of “kidnapping” an armed soldier that was apprehended in civilian clothing by indigenous guards. 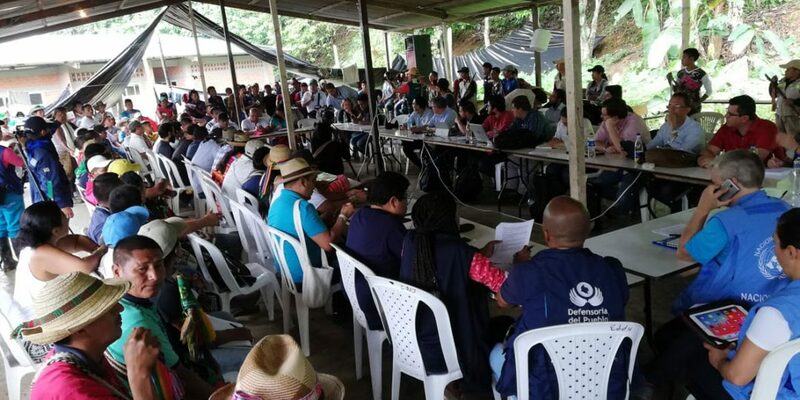 The ONIC then assumed the negotiations in the nearby Valle del Cauca province, but quickly learned the government would not promise to stop making baseless accusations in regards to the protesters and also those talks ended. Meanwhile, indigenous peoples across Colombia have joined the Nasa nation from Cauca and in some cases also erected road blocks to force the government to seriously consider their demands. Indigenous peoples from the provinces of Nariño, Tolima, Choco, Antioquia, Huila, Caqueta and Putumayo, Norte de Santander and Boyaca have joined the protests initially only held in Cauca.